The Procurement and E-Commerce Department encompasses the traditional Supplies functions of Stock and Non-stock ordering with those of Purchasing, Contracting and Creditor Payments. The Procurement and E-Commerce Department was formed in May 2009 and is now recognised as one of the leading NHS Procurement Departments in the country. We were the first Procurement Department across the NHS achieve the Level 2 Procurement Standard. How does NHS procurement work? E-Commerce Department enabling 30 day and 10 day SME payment targets to be met. Dedicated Purchasing Leads are aligned to Trust Divisions. £8 million annual savings targets on non-pay spend of £612m. An actively implemented zero inflation policy which has been adopted by the Department of Health. Manchester University NHS Foundation Trust (MFT) is part of the Shelford Group comprising ten leading NHS multi-specialty academic healthcare organisations. The Trust takes part in a number of joint purchasing projects. 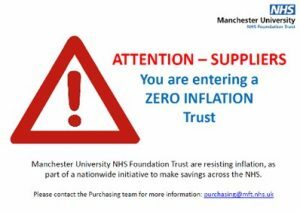 What does this mean for suppliers and why work with the Trust? Harmonisation of services – economies of scale enabling joint contracting. Standardisation of equipment – economies of scale. Reference site – New hospitals development with state of the art equipment. Birth place of NHS (Trafford Hospitals Division). Ability to work with procurement professionals. Being a supplier to MFT is an accolade that often leads to further sales. The Trust is committed to sustainable procurement practices. Sustainable procurement is a process whereby organisations meet their needs for goods, services, works and utilities in a way that gets value for money on a whole life basis. This means generating benefits both to the organisation and to society and the economy, as well as minimising damage to the environment. Procurement and E-Commerce in our Trust represents £612m spend per annum. 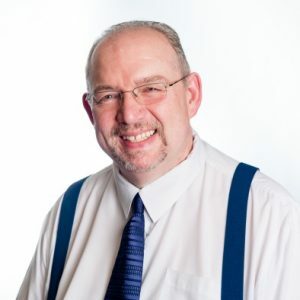 This involves supporting every budget holder in the Trust – ensuring that they spend their non-pay budget effectively and in line with both Trust/Legal requirements. 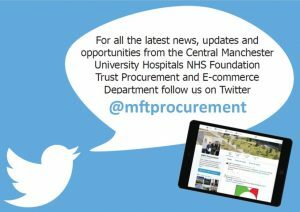 Our Department is unique in the NHS as the complete range of Procurement and E-Commerce services are provided by one unified Team. This ensures that supplier selection; ordering; invoicing and payment are all within the same Department ensuring co-ordination and better control. I hope the information on this site is of use – we aim as always to provide easy to use self-service systems/information whilst making sure at all times a member of our Team is available to provide personal support.